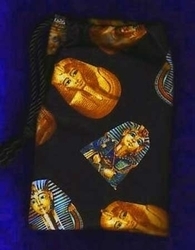 Regular Tarot Bags - Pharaohs Regular Bag & Cloth Set - Tarot Bags, Tarot Cards, Cloths, & More! 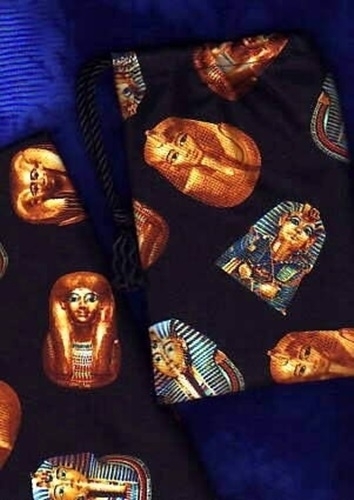 Sketched from actual artifacts discovered on archaeological digs that are now housed in museums, the images of six Pharaohs and Egyptian queens are scattered over this black cotton fabric. 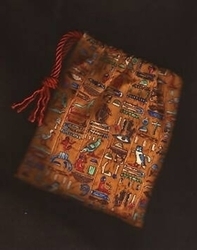 Perhaps, the depiction of these ancient rulers on this bag and spread cloth set will even provide an ancient and highly symbolic mysticism to aid the readings done in its presence. Many decks would coordinate with this set. 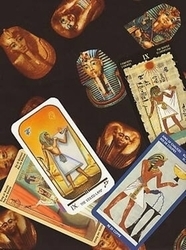 Some of those include three Lo Scarabeo decks � Tarots of the Sphynx, Egyptian Tarot, and Ramses, Tarot of Eternity � and an AGM Mueller deck, Ibis Tarot. 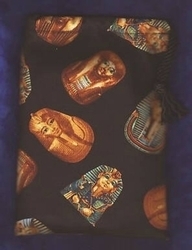 Another deck that is a perfect fit and color/theme coordination is Clive Barrett's Ancient Egyptian Tarot. If you own the Tarot of the Ages, you'll find it is an excellent match too. There are numerous goddess and world cultures decks that would match wonderfully with this set. Those are too numerous to list here, but look within your deck collection for ancient Egyptian gods and goddesses and you will likely find more than a few. The cloth is finished with a wooly nylon rolled hem.